Customers are often told that their receipt or certification is sufficient to demonstrate the value of their jewelry. Whether you’ve just got engaged, or want to know how much a family heirloom is worth, a professional jewelry appraisal is essential to ensure your insurance provider has the best information about your jewelry in the event of a theft or loss. Heritage Appraisers, Inc. is the largest jewelry appraisal provider in the United States, performing 2500 appraisals per month. All of our appraisers are professional gemologists and graduates of the Gemological Institute of America (GIA). We use The Loupe (R) appraisal software system and our appraisals are securely stored online for easy access anytime, anywhere. We want you to have peace of mind when having your fine jewelry appraised. We take pride in the high approval rate of our jewelry insurance appraisals. Do you need assistance with an update or modification to an existing appraisal? Click here for more information. How much does the jewelry appraisal cost? We base our rates on time and complexity, and never a percentage of the value of the item appraised. Click here for a sample jewelry appraisal. Insurance appraisals for jewelry are generally delivered the same day of the appointment unless there are items that need additional research to complete a comprehensive document. In addition, Heritage Appraisers uses The Loupe, which allows you to securely access your appraisal online anytime, anywhere. At your convenience, you can download and email your appraiser to your insurance company. What qualifications should you look for in an appraiser? It is important to verify your jewelry appraiser has all the necessary credentials to perform a qualified analysis of your jewelry that an insurance company will accept for a policy. All of our appraisers have completed the Graduate Gemologist (G.G.) 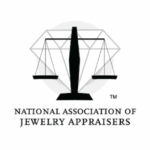 certification from the Gemological Institute of America (GIA) and are members of National Association of Jewelry Appraisers (N.A.J.A.). Our appraisers also adhere to the USPAP (Uniform Standard of Professional Appraisal Practice) guidelines. Heritage Appraisers is also a sustaining member of the American Gem Society. Heritage Appraisers professionals do not sell or purchase jewelry items and will offer the client an independent appraisal with unbiased opinions and values. Heritage Appraisers, Inc. is proud to have an A+ rating from the Better Business Bureau. Do I Need a Jewelry Appraisal? Our clients have many reasons for seeking an appraisal, including valuation for insurance purposes, to settle an estate, or for liquidation for sale or dissolution of marriage. Unfortunately, our clients are often misled to believe that their receipt, certification, or diamond grading report will suffice for valuation purposes. An independent appraisal performed by a credentialed gemologist offers the full detail of the item, including description, specifications, and photographs, as well as a current value, to ensure that the item is fully insured. Clients who retain an insurance rider should maintain a qualified insurance appraisal to serve as proof of ownership and provide a current, acceptable replacement value.